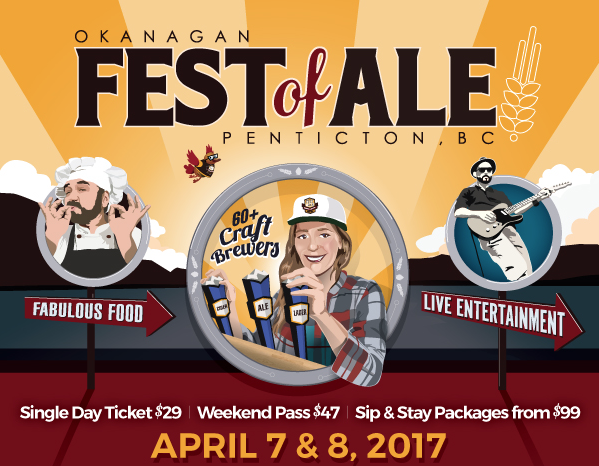 The 22nd Annual Okanagan Fest of Ale, one of the biggest and best known craft beer and cider tasting events in the Pacific Northwest, takes place next week at the Penticton Trade and Convention Centre Friday April 7th and Saturday April 8th. Tickets are still available, but are selling quickly. Guests of the fest are sure to enjoy culinary delights from 12 local restaurateurs including a selection dishes with a craft inspired twist including savory dishes from Brodo Kitchen, donuts from Craft Corner Kitchen and cool treats from Gorgeous Georgia’s Ice Cream. Live entertainment takes place throughout the venue and includes an eclectic mix of talented performers with a diversity of styles – a great compliment to the diversity and range of styles of brews being offered at the event. Moments Under Frame Photography will be on hand with a fun photo booth and a “pop up liquor store”, manned by the friendly folks from the Government St. Liquor Store & Wine Shoppe, will be stocked with all the favourites your certain to find at the event. New additions to the event include an app to track tastings and the addition of an educational home brewing display along side an expanded area showcasing industry related personalities and information. In addition, the fun and festive crew from Cascades Casino will be setting up a few gaming tables. In addition to the 2-day Consumer Tasting organizers of the 2017 Okanagan Fest of Ale are excited to be showcasing craft themed events throughout the week of the main event as a part of Okanagan Beer Week™. Participating restaurants include Craft Corner Kitchen, Brodo, Nest & Nectar, Tacos Del Norte and Burger 55 each of which will be offering a unique craft themed lunch or dinner featuring local craft brews. Joe Wiebe, The Thirsty Writer, will be offering a seminar and tasting focused on IPA’s at Bad Tattoo Brewing on the Thursday evening April 6th, local area breweries will of course be open for tastings throughout the week. A specialty cask event will also be taking place on the Saturday evening at the Kettle Valley Statin Pub. In anticipation of a busy weekend, The City of Penticton the City of Penticton in partnership with BC Transit has arranged for free shuttle service to the SOEC complex on Saturday April 8th for guests attending the festival, visiting the newly opened Cascades Casino or attending the Weezer concert. Additionally, in partnership with the BCLDB all guests attending the event will be given a voucher for a discount on a cab or shuttle ride home to Get Home Safe. Coconut Express is also offering shuttle service to the event on both days.